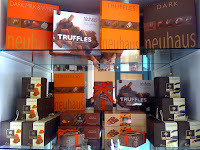 Neuhaus was the inventor of the Praline and Ballotin box. The Praline is a confection of various centres enrobed in chocolate. The Ballotin box is the small elegant box that pralines are sold in. Wrapped in a red Ribbon 1/4lb Assortment of their best selling Pralines. Wrapped in a red Ribbon 1/2lb Assortment of their best selling Pralines. 40 Crunchy Milk Napolitans - Speculoos (Belgian cinnamon cookie), Caramel, Feuilletine (Crunchy wafers from Brittany), and Bresilienne (caramelised hazelnuts). 60 "10 Flavours" Napolitans - add Smooth & Creamy (with a touch of vanilla), Coffee, Rich & Intense, Strong 72%, Dark Earl Grey Tea, Dark Raspberry, Dark Exotic Lime. Diavola - Traditional butter biscuit with almonds, coated in dark chocolate. Amandagio - Traditional butter biscuit with almonds. Dark, Milk & White - a selection of 16 Pralines. Dark - a selection of 16 Dark only Pralines. Truffles - Amere, Tiramisu, Beurre, Congnac & Paillettes Cafe - 16 Truffles. Truffles - Classic, Dark, Caramel, Cappuccino & Speculoos - 16 Truffles. Orangette - Candied orange peel coated with chocolate. Amourette - Praline with almonds and hazelnuts. 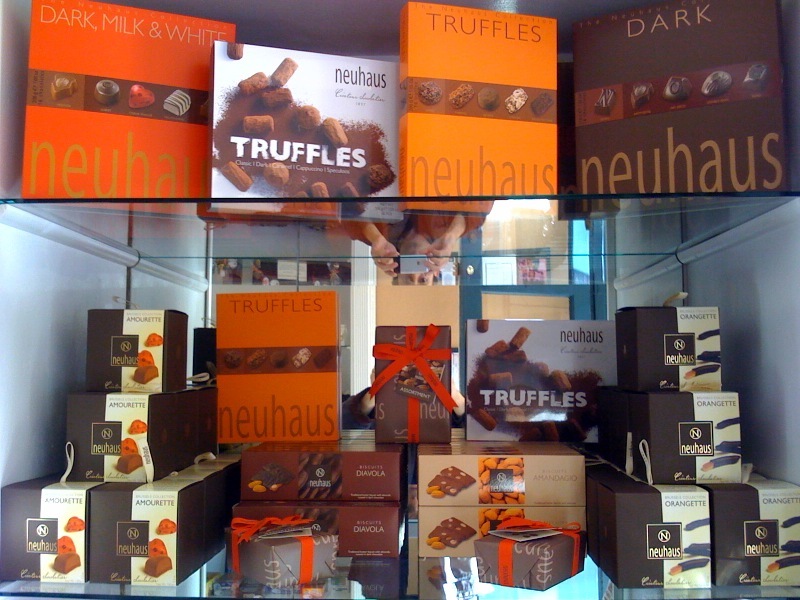 Delicious hot chocolate - the full flavor of Neuhaus Chocolate in an instant. Made with 38% cocoa.